The seed was planted for a video tutorial after a comment was left on one of my slideshow clips that I’d uploaded to YouTube. 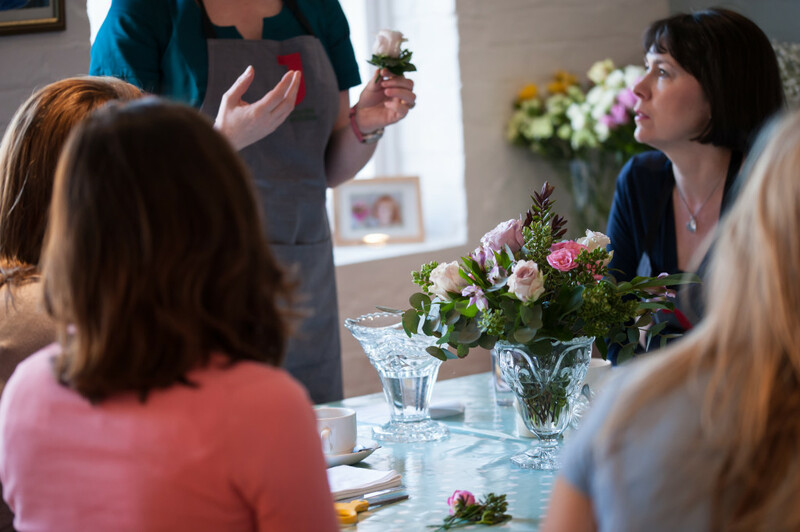 The lovely Samantha from Samantha Jones Kent Wedding and Lifestyle Photography has photographed two of my workshops and despite my pain and anxiety I had managed to edit her stills together to tell a story (someone noticed! ); and master the art of title and credit notes, with a bit of pan and zoom and background music thrown in. Visiting my sister one weekend she asked whether I was constantly thinking about my business. Obviously, the answer was yes. With words of wisdom (perhaps she’d read them somewhere? ), she said that my business should be making money even when I was asleep. You’ve got to make a YouTube tutorial by the end of the summer, she said. My sister is quite forthright when it comes to making plans for other people! I left the thought mulling over in my mind for a week or six. By the end of July I was in my kitchen, with swimming pool hair and make-up, and last week’s flowers in my hand being filmed by said sister. She made quite a few good observations (I’m choking as I write). Following me with a camera was making her feel sick: she would only raise the camera from a horizontal position from my hands up to my face in short vertical movements and wouldn’t be panning from side to side as I reached for foliage, and so on. I also needed to learn how to arrange flowers back to front, so that the camera saw what I was doing, rather than me arranging flowers for myself (and being able to see what I was doing). We also soon got the hang of the delay in recording between the button being pressed and me being allowed to speak. The rest of the family gathered for the screening and they thought it was rather fabulous. Who knew that I was so knowledgeable about flower arranging and could offer so many hints, tips and advice? I was urged to upload immediately, but I put my foot down. That dreamy moment of my family acknowledging me as an expert was rather lovely. I also grabbed the chance of a bit of market research by getting them to watch a short video that I liked and hearing their feedback. A valuable lesson in what a potential client wants to know and “reads” and hears from the screen. Anyway, they have each assigned themselves roles as my producer, publicist, stylist, housekeeper and more. Gee’d up by the excitement, the following weekend I brushed my hair and bought fresh flowers for the real thing. A cameraman in place this time (and a different shorthand for action and cut). Some rubbish moments and some flow (and a few cross words). I thought I’d been really clever in filming my introduction at the end of the film, so that I could show what I was going to be making at the start of the tutorial by cutting out the end section and moving it to the front of the tutorial. Fabulous. I’d thought of everything, except for the fact that by the end of filming the camera had slipped so that instead of the lower edge of the frame lying level with my kitchen table it had dropped slightly so that you could see the hem of my dress below the table top: but it wouldn’t matter would it? Unable to sleep I finished my editing over two days, staying up until 2am in the process. I saved the preview screening until the Friday night and clicked the button for full screen – and then. The moment of truth slowly dawns. Do these tutorials represent the professionalism of me and my business? Out of the four videos I made (two x two minutes; and two x five minutes), I think perhaps one of the short ones might be OK. But is OK good enough? Can you recommend a videographer that could film and edit for me? Hi Lisa – lovely to hear from you. I’m not sure whether my knees are up to general exposure. It’s trousers for me from now on!